Little Bang Brewing Company has released Tangerine Schwang, a citrus-laden Berliner weisse, into cans for the first time, along with a new take on their sour NEIPA, made with 200 kilos of mango puree. “Do you want to try the new beer?” Filip Kemp calls out, as CityMag approaches Little Bang’s still-new (and still evolving – the kitchen is imminent) Henry Street brewery. We’ve visited to talk with Fil and his Little Bang co-founder Ryan Davidson about a prior release – the super tasty Mango SNEIPA (AKA sour New England IPA) – but we’re never one to turn down a mid-morning sip of something pouring straight from the tank. “It’s Tangerine Schwang. So it’s only like three per cent, a Berliner Weisse” Fil assures us. The beer is a sessionable citrusy fruit punch, released just in time for the last burst of warm-ish weather before autumn truly takes hold. “It’s absurd how fast a pint of that is going to disappear. We should put a warning on it,” Ryan says. Tangerine Schwang, like its sister beers Schwangberry and Schwangcherry, has been kegged at Little Bang previously, however this latest release is the first time Tangerine has been released into package (with a “sarcastic Sunkist”-inspired label), and also the first time it’s been made with real juice. “We’re trying to really move [in that direction],” Fil says. “Sarcastic Sunkist” design by Matt O’Connor. Similarly, the Mango SNEIPA makes use of 200 kilos of Kensington Pride mango puree, sourced from Queensland, and is an elegantly balanced combination of flavours. Little Bang has been producing NEIPAs since early 2018 when they debuted the first edition of Undercover Fashion Police, poured straight from the tank at the brewery’s birthday party. Ryan and Fil were interested in the style after having some delivered to the brewery by customers directly from the States. “We have quite a few customers who travel internationally regularly, and chatting about beers, it’s lovely what presents they’ll bring you back,” Ryan says. “We got to try some of these New England IPAs fresh from the source within a couple of weeks of packaging. They were really, really something. In the 12 months since, the Little Bang take on the hyped style evolved, and when they were approached to contribute to the Carwyn Canvent Calendar the brewers concocted the first release Little Bang sour NEIPA. “We knew Carwyn Canvent Calendar was over 1000 cases going out there all over the country [and] out of 24 beers, one of them would have our name and our label on it – that’s great,” Ryan says. “So yes, it’s being a little bit sarcastic, but we don’t have to be so damn serious about the whole thing too. It’s not war out there. This is beer, for Christ’s sake, and this is the silly end of beer, so let’s be silly, but let’s try and actually smash this silly idea together. In January, the brewery released a Pineapple version, and three weeks ago came the latest iteration – the Mango SNEIPA. The beer is made of ingredients wholly sourced from within Australia – the mangoes, the mixture of grain (Little Bang now uses Coopers exclusively for its base malt), and the hops – a combination of Vic Secret and Galaxy, which were selected for the way they would work with the beer’s feature fruit. “Galaxy’s got that passionfruity character to it, which goes well with mangoes, and Vic Secret’s a bit more tropical fruit, tropical punch kind of thing going on, which also softens that out,” Fil says. Both the Tangerine Schwang and the Mango SNEIPA showcase the value of producing beer with fresh, seasonal produce. Ryan says Little Bang is not against the idea of using essences ad extracts if the beer calls for it, but he says seasonality should be seen as a positive attribute in the beer industry. “People will happily accept annual vintage differences in wine, in fact they celebrate it – I think we should go to what’s really strong,” he says. Both the Mango SNEIPA and Tangerine Schwang are available to take home from the Little Bang brewhouse and all good local and independent-inclined bottle shops. Stay tuned to Little Bang’s social media for updates on future releases. They plan to release one new beer into a packaged take-home pack each month, including favourites previously only released in keg. 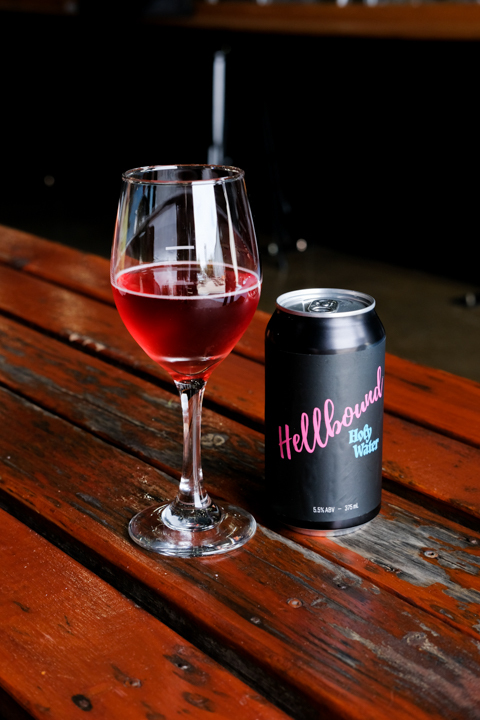 Before CityMag leaves Little Bang’s Stepney warehouse, Fil, ever the host, offers us a parting drink – another relatively new release, Hellbound Holy Water, made in collaboration with the titular Rundle Street wine bar and 919 Wines. The drink is a mix of Little Bang’s hibiscus sour, The Pinkening, and 919’s Pale Dry Apera (apera is the name given to fortified wine made in the style of sherry but which is not made from grapes grown near Jerez de la Frontera in Andalusia, Spain), and had been the unofficial knock-off of choice for Hellbound’s co-founder, Mark Reginato. “They’re just cheeky little devils and they’re all about perpetual indulgence and debauchery, all of them. Reggie’s the worst of them. So they just combine everything with everything,” Ryan says. “This came out of one of their experiments, but they just kept coming back to it, and they ended up giving it the name Hellbound Holy Water. The beer was released on Thursday, 14 February and is already almost completely sold out, much to Fil’s chagrin. “I was [initially] very unimpressed, and then when it went into cans it was bloody delicious,” he says. If you happen to find a can, snap it up.